Things for Wings continues to evolve as the years pass by. I started out selling just toy parts and look how much it has grown! There has been some growing pains and those continue. After too many years of making toys, I took a break and thought if I ever had to make one more toy it would be too soon. I hadn't made any in a couple years, the Wingettes were making all the toys! The Wingettes flew the coop, they needed to expand their horizons, get better jobs and focus on school. Just this past month I had so much balsa left over, and figured I better do something with it. It felt like I was moving mountains to make a toy, but after a couple toys, the ideas were rolling in again! Look forward to new collections or reinvention of our old collections. Sourcing parts that were abundant 6 years ago, is tricky, which is why we have removed so many toys. Our website has a new look, the previous one I did not like one bit! This one is amazing, checking out your order has a new look too, much easier in my opinion. We will be expanding more into rabbits, chinchillas and small animals this year. Many of the new items coming will certainly suit birds of course. Avian Organics will expand their selection a little more with plans to include more dehydrated mixes and dry cage blends. Perhaps an Avian Organics version of popular honey sticks. 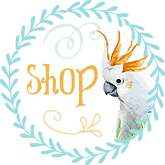 Things for Wings will not be shipping January 13 to January 31, we will have our website open but please order at the beginning of January if you depend on our foods for your parrots. Avian Organics and Things for Wings toys can be up to a 2 week wait.